This report serves as an overview and evaluation of the body of work executed in spring semester 2016 within the course entitled Blended Mobility – Connected Improvisation, which was a project in which new possibilities of online learning were developed. The course was a part of the strategic partnership NAIP: Innovation in Higher Music Education, supported by the Erasmus+ programme. The course was a collaboration between five institutions of higher music education: Iceland Academy of the Arts in Reykjavík, Norwegian Academy of Music in Oslo, Royal Conservatoire in The Hague, Prince Claus Conservatory in Groningen and Yong Siew Toh Conservatory in Singapore. The goal of the course was to explore the concepts of real-time playing and improvising together with teams of musicians that are not in the same room, using an online platform. At the core of the course stood a five-day intensive programme consisting of a series of workshops lead by various tutors. After the intensive playing together and getting to know each other, the second phase of the course was given on six Wednesdays throughout the spring semester 2016. The teams from Singapore, Oslo, Groningen, The Hague and Reykjavik participated simultaneously through an online connection, whereas the teaching was done in The Hague. Rolf Delfos: groove based playing, pop and jazz elements. Karst de Jong: ensemble improvisation techniques, non-style oriented. Bert Mooiman: improvising with classical elements. David Dolan: classical improvisation from music literature. Christoph Baumann: contemporary improvisation, conducting techniques. Ty Constant: warming up with African drumming. The idea to start the course with the students meeting in The Hague was to create a feeling of a group and play music together; to establish a connection. The intensive programme was followed up by six online sessions held on Wednesdays throughout spring semester 2016. The sessions were in the morning for the European institutions, and in the late afternoon in Singapore. Each institution provided a coach for their student group, who attended the online sessions, performed in-between sessions with evaluations and music making, and assisted the students with their home-work assignments as needed. At most of the participating institutions, the in-between local sessions worked well as intermediate sessions for the local group. An important aspect here was that the local coach was also an active participant in the online sessions. 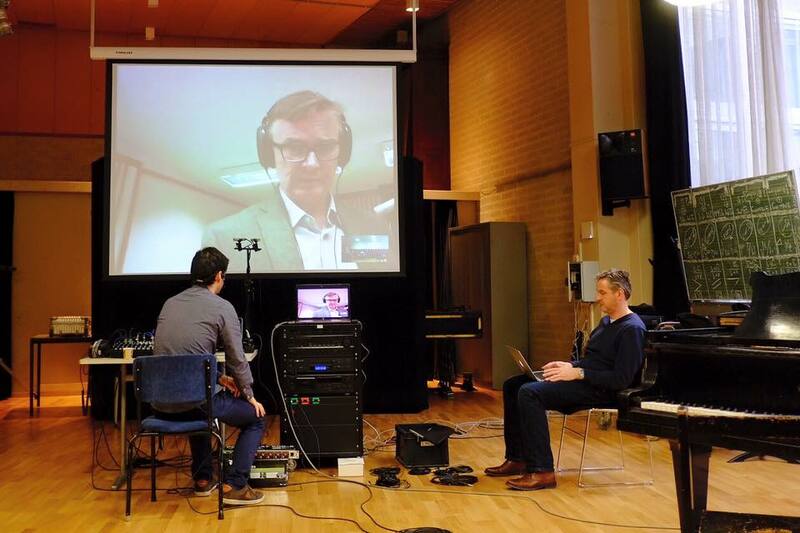 Karst de Jong, Ernst Reijseger and Bert Mooiman lead the online sessions from The Hague. The free software JamKazam was used to communicate, which is a low-budget solution developed for musicians to connect and play together across cities and nations. Google Hangouts was used for providing a video on a separate computer, while the sound was played through JamKazam. This was done because using the video feature within JamKazam would have created sound latencies. The working group had prepared a technical rider including what kind of room to use, the speed of the internet, audio interface, headphones and microphones (one per participant), headphone amplifier with individual volume controls as well as a computer with JamKazam installed. The choice of software reflected the approach of using the existing technology, accessible to everyone for free or on a low budget. This meant that the students were able to take advantage of the software they were already familiar with and to find solutions that would work for their projects. The students were encouraged to work in groups across the countries, building on the encounters from the intensive course. Even though JamKazam was used for the online sessions, the students could also explore and try out different technical solutions, that would be suitable for each project. Mats Claesson, head of composition, music theory and music technology department at the Norwegian Academy of Music, researched the technical possibilities within the scope of the project. He performed test sessions with products such as JamLink and Blend and found that JamKazam would be the best fit. In the online sessions, the students continued working on improvisation techniques they had been introduced to at the intensive course, playing with the fact that they were all in different places. This session was the first of all of us together. We tried out playing simple improvisations with two locations involved and the rest listening, later also with everybody playing at the same time. As material we used the name motives that were developed at the IP course. Homework: to develop a group improvisation with these motives. 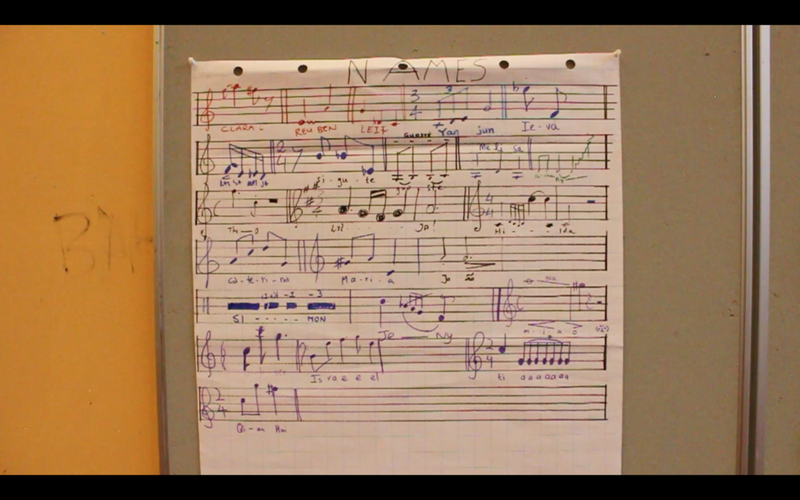 In this session Bert improvised with material from the book ’50 standards of Renaissance and Baroque’. Homework was evaluated with one location playing at a time and the other groups listening. New homework: make a group impro with your own group on ‘The Bells’. Some groups posted results on the Facebook page. In this session we experimented with conducting from one location to see which possibilities this would give. Also we came back to the Ostinato game as developed in the IP. The homework was to develop different ways of playing with the concept, making variations and finding ways of mixing previously ‘composed’ parts with improvisation. In this session we had one of Holland’s leading improvising artists play with the students. We were very lucky to have a real good connection with little delay. It allowed for some great free playing and experimentation. See elsewhere in this document the audio example ‘drone development’. In this session we tried to build further on some idea’s of the previous one. Notably more free playing with alternating leading and following of the groups without pre-planning. Also the quick interaction game was repeated. As a concrete improvisation piece we worked on ‘La Folia d’España’ and other simple harmonic ‘grounds’ as the basis for improvisation. In the final session we evaluated the Folia pieces by playing for each other and commenting. The upcoming individual projects of the students were also discussed as well as deadlines for submission etc. This is an excerpt of the session of March 16th where all groups played simultaneously together, basing the improvisation on switching drones. It is particularly nice to hear the bongo ostinato rhythms from Singapore with a brilliant Cello solo from Ernst Reijseger in The Hague on top (starting form 10:36). There are no timing problems, and great synchronicity. This is an excerpt where all groups are involved in a rotation game: every group has to make a loud sound in a fixed rhythm, whereby we rotated: Singapore -> Den Haag -> Groningen -> Iceland -> Oslo. A group could break the beat by not playing, in which case the rotation would turn around in the other direction. The students also performed homework assignments in groups across countries as well as a final project. All communication and assignment delivery was done through Facebook. Students could communicate there, teachers could post announcements and students could deliver assignments, recordings and videos, all through a closed Facebook group. Students could decide to use other methods than JamKazam to record if they found something that worked better. Some used JamKazam, some used Source-Connect Now, both free softwares, and others recorded while on Skype, each recording their own track and combining the tracks afterwards. As stated above, the students were encouraged to explore and find appropriate technical solutions, that they were capable to use without technical support. This is a clear example of how pointing the students towards finding their own working methods and to work independently. Evaluation - What have we learned? The strongest element of the course was without a doubt the opportunity for the students to work on collaborative projects between countries, strengthening their network and cooperation possibilities. This is especially important for NAIP students since the student groups at each institution are often quite small. The technical support of the different institutions was very varied. The institutions with the strongest technical support had the biggest success in implementing the online sessions. The institutions with lacking technical support slowed down the process considerably and a lot of time was spent on sorting out how to get everyone connected. Furthermore, the students at the institutions with the technical problems tended to feel left out of the sessions. For future projects it will be important that all participating institutions have the necessary technical support. As this was a pilot project and the situation was completely unknown to all participants, the organising team decided to stick to a firm leadership from The Hague for all the online sessions. This had both positive and negative effect. The positive was that the content of the sessions was well organised and the goals for the sessions were clear. However, this setup felt limiting to some participants, students and teachers. The different teams of the different countries might have felt more ownership of the project, had they rotated the leadership from one session to another. The students felt they could have been given more responsibility of leadership, giving them more opportunities and flexibility to experiment and work with concepts. When it comes to the connection between the intensive programme and the online sessions, the students felt that the intensive programme could have introduced the online concept a little bit better, which would have helped at the start of the online sessions which followed. The students did mention how important it was to meet as a group in The Hague before the online sessions started. They got to know the students they would be working with online, their personalities and musical styles, and got the opportunity to form smaller groups. They mentioned that the days in The Hague had made the foundation of the future collaboration, without which a successful online collaboration would have been impossible. Comments from both students and teachers suggest that the course still needs preparation regarding how to develop and contextualise the online concept from an artistic perspective. Since this was a pilot project most of the preparation time and energy was spent on finding a platform and a technical approach to the course. The concept of how to work with online performance and collaborative music making could be central to such a course. If the starting point is a low-budget technical approach it is even more important that the conceptual ground work is firmly established. This is why the artistic concept development is so important, including encouraging the students to meet the situation with a critical approach and to contextualise their artistic ideas about the online working environment. Examples of artistic online concepts from the fields of music and performing arts do exist and should be used as inspiration for further work with such a course. See for example: Herbergi408 – Online Theatre and Michael Dessen’s and Mark Dresser’s Virtual Tour: A Reduced-carbon Footprint Concert Series.